The General Elections of 2014 have generated a sense of excitement around politics, seldom seen in the past few years which have been ridden with corruption scams, exposes and a heightened cynicism. Over 814 million people will participate in this mammoth exercise, 120 mn. of them being first time voters. It is no surprise therefore that living rooms and social media are abuzz with discussions on the result of the election. Till about December, such conversations revolved around the decline of the Congress and the potential gains for the BJP under Narendra Modi, the developments over the last few months have thrown another player in the fray. The electoral debate has now been reduced to a Modi vs. Kejriwal showdown. What is being missed is the role that regional parties will play in forming the next government of India. The elections in 2014 will be the 16th General elections in India. Until 1967, the outcome of the general elections brought a single party in power (Congress) since it enjoyed popular support as the symbol of our independence struggle. However, by the mid-1960s, this dominance began to be challenged by many regional political forces, first at the state level, and later also at the national level. Several reasons are cited for the rise of regional parties in India. Some parties like the Dravidian parties of the South were formed to challenge the then prevailing dominance of North Indians and Brahmins in the Indian political and social setup. Some like the Akali Dal emerged out of religious reform movements, and eventually served to protect the interests of a particular religious community. Lastly, many parties emerged as a result of the growing dissension within the ranks of other All-India parties, particularly the Congress. The growing centralization in the decision-making process of the Congress was resented by many state leaders, who found it better to constitute separate political parties to address local and regional concerns. The Trinamool Congress in Bengal and the erstwhile Utkal Congress in Odisha are examples of such regional political outfits. The next wave of regionalization happened in the early 1980s, a phenomenon often described as the Mandalization” of politics in India. The political mobilization of backward classes in India led to the emergence of many regional parties such as the RJD in Bihar, and the Samajwadi Party in UP, both of which have enjoyed considerable success in Assembly and Parliamentary elections. In the last two decades, the combined vote share of the Congress and BJP has been declining, therefore the last five general elections have shown that ‘India’s elections are least national in character’(M.K. Venu, The Hindu, June 12, 2013). 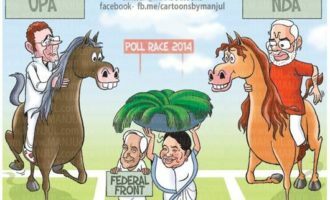 If anything, regional parties can be expected to play an even greater role this time for many reasons with the fate of approximately half of the 543 seats in Parliament being significantly affected by regional players. There are several reasons for the growth of regional parties. Firstly, many state governments led by regional parties have managed to achieve significant success in addressing developmental and governance issues over the last five years. In Tamilnadu, governments led by either of the 2 main Dravidian parties have achieved considerable success in public health. The focus on building physical and human resources in public health have ensured that TN has one of the lowest maternal mortality rates in India, and 81% of infants in the state are fully immunized. Similarly, the BJD-led government in Odisha deserves to be complimented for its unprecedented feat in disaster management when nearly a million people were evacuated before cyclone Phailin struck the east coast of India. It was described by the UN Secretary General for disaster risk reduction as a “landmark success story (which could be used) as a model for other cities and countries”. Likewise, Bihar under the JD(U) led government, saw a massive turnaround in its fortunes when it became the fastest growing state in India in terms of GDP in 2012. These examples are not meant to suggest that BJP/Congress governments in other states are not doing well. However, it does indicate that alternatives do exist, and people are likely to choose such alternatives wherever they have the choice. More so, because regional parties more closely represent the aspirations of the people of the state. At the same time, with voters hardly seeing any substantive difference between the policies and programmes of the Congress/ BJP their ‘vote for change’ may be earned by regional parties. Good governance in the states may be rewarded with more seats at the Centre for many of these regional forces. Lastly, in a personality-driven election, our media’s obsession with one or two personalities may not be a true reflection of the impact that regional political leaders have on popular imagination in their respective states. This is especially true of states outside the Hindi heartland, where leaders like Jayalalitha, Naveen Patnaik, Nitish Kumar are capable of garnering votes through their personal charisma complemented with their record of good governance. While it is generally agreed that coalition governments are here to stay, there is considerable debate on whether such an arrangement is beneficial for us. While it is argued that coalitions stymie fast decision making, the fact is that coalitions have made politics in the country more accountable to the coalition partners as well as to the masses. There is a lot more internal democracy within parties today than during the presence of a strong single party leadership at the Centre. Further the other advantages of coalitions far outweigh the disadvantages. In a federal system the representation of multiple parties in Parliament leads to to more balanced and inclusive socio-economic development. The special concerns of different states have a better chance of being addressed, while still keeping in view the broader national picture. In particular, a more just and equitable arrangement for distribution of Central revenues between different states can be evolved.. In conclusion, it can only be said that a coalition government at the Centre with regional parties playing a cooperative role in nation-building is good for India, and must be embraced as the verdict of the people. Prof. Sumantra Bose endorses this view when he says “For all the flaws and vices of many of contemporary India’s regional political figures, the regionalisation of India’s politics is a democratic outcome that has emerged through the dynamic evolution of India’s democracy over six decades”.After all, national interests are an aggregation of regional interests in a federal democracy.